Range upgrades for the Jeep Wrangler have been topped off with the launch of a special, limited edition Anniversary model, to celebrate the marque’s 75th birthday. It is a Jeep tradition to celebrate key anniversaries, or the conquering of inaccessible places, with special editions, so to mark this historic milestone, the brand has introduced a 75th Anniversary special edition offered on all models of the line-up including Wrangler, of which only 85 are destined for the UK. First revealed at the Geneva Motor Show in March, the Wrangler 75th Anniversary is based on the Overland model, but with several key differences, including unique exterior styling and part-leather interiors. 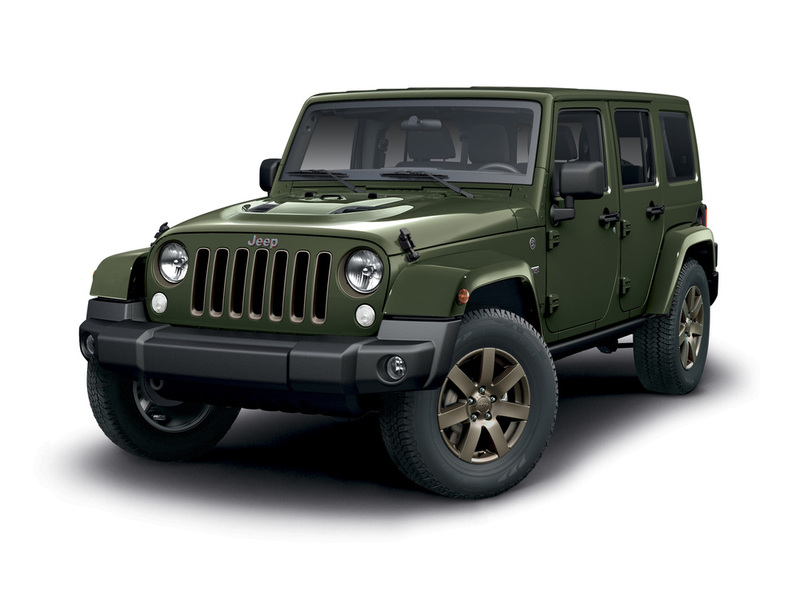 The exterior features a bronze-finished front grille and 18-inch alloy wheels, body-coloured dual top, Mopar slush mats, unique bronze and orange Jeep badging, and a dedicated 75th Anniversary badge. It is available in Bright White, Solid Black or Sarge Green colours. Inside, there are ‘1941’ embossed leather heated seats in black or saddle brown and tangerine (leather with fabric inserts), bronze accents on air vents and grab handles, satnav with an Alpine premium sound system and deep tinted sunscreen glass. The new Jeep Wrangler now starts at £31,840 OTR for the 2-dr Sahara 2.8 CRD auto rising to £34,910 for the 4-dr Rubicon 3.6 V6 auto, while the 75th Anniversary model starts at £34,765 OTR for the 2-dr 2.8 CRD auto rising to £36,435 for the 4dr 3.6 V6 auto.